When Apple's Power Mac G4 came out it was classified as a super computer. It had dual-processors! What would the people of the past have made of this tablet computer, which is the first to have a quad-core processor? Hell, what will the people of today make of it? On paper this absolutely blows all other tablets out of the water. Besides being the first to use NVIDIA's new quad-core (plus one) Tegra 3 a.k.a. Kal-El processor (click here for an amazing demo of what it can do), it looks gorgeous. 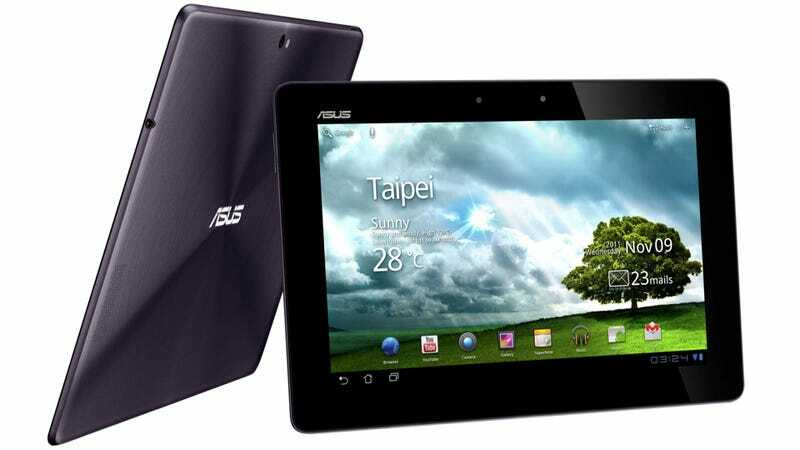 The original Asus Eee Pad Transformer was one of the most popular Android tablets of the year, but it was thick and boxy—just sort of a big, boring rectangle. The Transformer Prime is way more attractive. They've swapped out the cheap plastic back for some very nice looking aluminum with a swirl pattern. It is extremely thin and light: 8.3mm (or 0.33 inches) and 586 grams (1.29 pounds), which is slightly thinner and lighter than the iPad 2, despite the Prime's screen being larger by 0.4 inches (10.1 versus 9.7 on the iPad 2). Speaking of the screen, it's a Super IPS+ display (at 1280x800) under Gorilla Glass and has a 178-degree viewing-angle and some proprietary tech that supposedly makes it much brighter. The original Transformer and the Eee Pad Slider both had pretty ho-hum screens, so this is a welcomed upgrade. And yes, it's a Transformer Pad, so you know it's got a keyboard dock (sold separately). We liked the original, but this new dock will be thinner and sport an aluminum casing with a revised metallic swirl pattern to match the Prime unit. Touch-screen typing has grown by leaps and bounds, but when you've got to pound out some serious emails there's no substitute for a real keyboard. One of the other main boasting-points is battery life. They claim to have the best battery life on any tablet, with 12 hours of real usage. Attach it to the keyboard dock and that number jumps to a whopping 18 hours. The Tegra 3's advanced power management helps with this. There's a 1.2 megapixel camera on the front, and an 8 megapixel camera on the back with an impressive F2.4 aperture, and it can record 1080p video. Personally, I'm still not convinced that we need serious cameras on tablets, but what the hell, might as well go nuts, I guess. It's got a micro HDMI port, and if you attach the dock you get a full-sized USB port and an SD card slot, too. They've also pimped out the audio with larger speakers and increased fidelity. Oh, and Android 4.0 Ice Cream Sandwich should be coming to the Transformer Prime soon. Like, "early December" soon. Like, maybe even before it launches (though Android 3.2 is the official plan). Obviously, there are a lot of very bold claims here, but if they bear out this will be a killer device. The Tegra 3 chip is just incredibly exciting. Theoretically we should be able to play games that rival the graphics and speed of high-end gaming consoles. I really want to see what developers start creating. The Eee Pad Transformer Prime will come in two colors ("Amethyst Gray and Champagne Gold") and with two sizes of storage: 32GB for $500 and 64GB for $600. Asus flat out said that the Prime is being marketed as a "Premium" device, and that they will continue selling the original Transformer as their more "Mainstream" device at $300 for the 16GB $400 version and $350 $500 for the 32GB. For both Transformers the keyboard docks will cost $150. It would be nice to see all of these prices come down, but seeing as how this is the only quad-core tablet that's been announced so far, it pretty much gets to call the shots. No specific launch date has been given, just "December". Stay tuned. Update: Turns out the original Transformer will continue to cost $400 for the 16GB version and $500 for the 32GB version. Yes, the same $500 the infinitely better 32GB Transformer Prime costs. I would expect those prices to drop when the new baby comes, but hey, what do I know?